This is my third Tasty Tuesday of 2019. And just like the previous two posts: Chocolate Dessert and Banana Dessert this recipe also does not have a very imaginative name. :)Who knows what I'd call this one if I had the change. Let me start by saying, I am a HUGE fan of cottage cheese. I know some people do not enjoy it/think it's gross. But not me, I could eat a whole container in one sitting. And using cottage cheese in something sweet is not new to me. My Yia Yia (grandmother in Greek) used to make a cheesecake where one of the main ingredients is cottage cheese. I also recently saw a video my Lemonade Mom and she MADE cottage cheese in her Instant Pot! Oh yeah, I am going to try that soon! 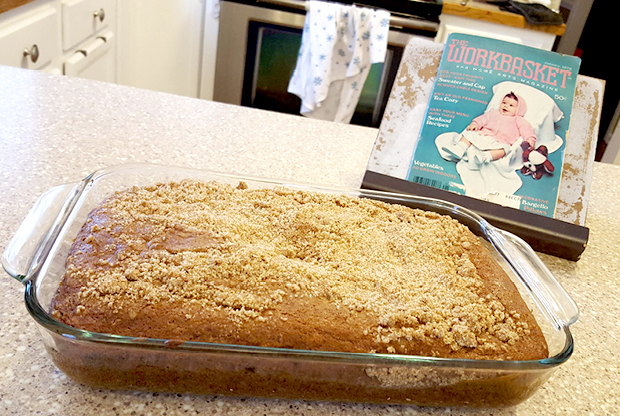 Also note, the recipe calls for using a 7.5 x 11 loaf pan. I wasn't sure what that was. I think of a loaf pan as something like this. So if you forget the part about it being a loaf pan, you get this—which I have. 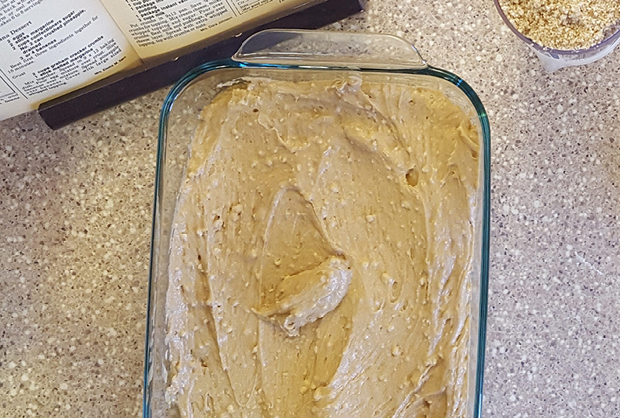 And if you put 7.5 x 11 loaf pan into Google you get bubkus. Anyway, let's get into this recipe. 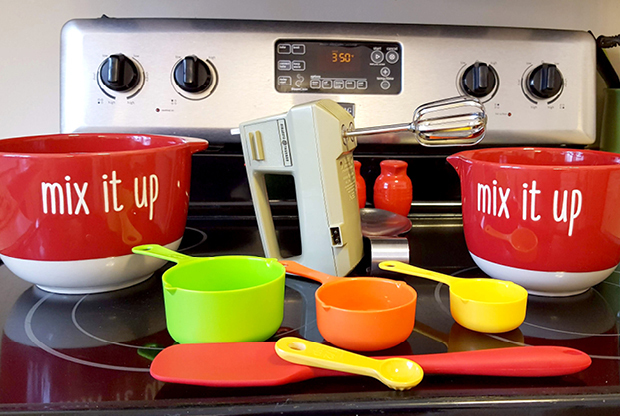 2 New Mix it Up ceramic bowls—purchase at Hobby Lobby…love the Rae Dunn feel. Oh and they are red! General Electric hand mixer—I bet it's as old as I am. My MIL gave it to me. This is similar—but not the same. 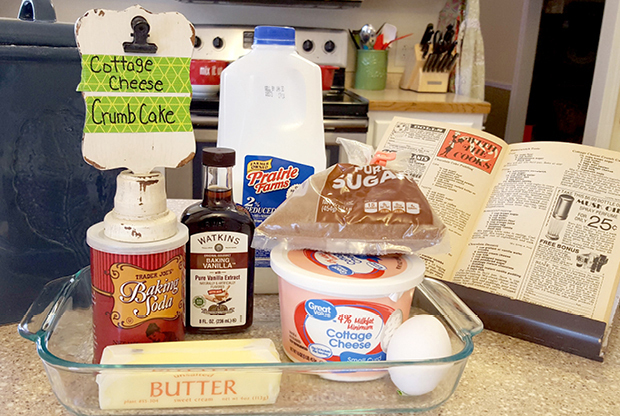 Here are the ingredients for the Cottage Cheese Crumb Cake: flour, baking soda, butter, vanilla, milk, cottage cheese, brown sugar, and an egg. Note: I forgot to pull out the coconut oil spray for greasing the pan…there for I forgot to do that. Also, buried in the instructions for this recipe, it mentions flavoring with Black Walnut extract—which I do not have nor do I have the inclination to make some at this time. This actually caused me to ask for some advise over on my Instagram page about which of my extracts to use. I used vanilla. I left the egg and the stick of butter out to reach room temperature. This took about an hour. 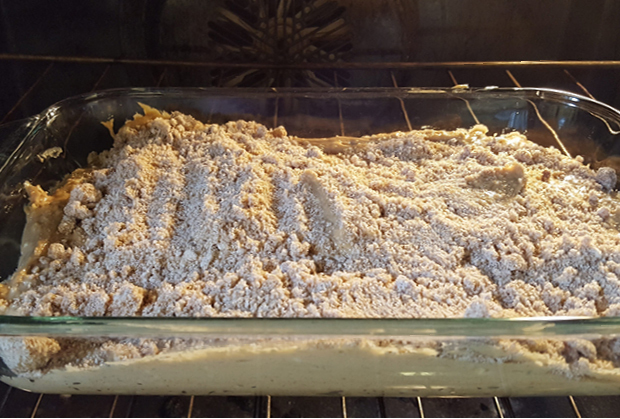 You start by making the crumb part of the crumb cake—mix the brown sugar, softened butter, and flour. Mix these three together until it makes a sandy texture. Look at that sandy goodness! Hold back 3/4 of a cup of the crumb for the top of the cake. 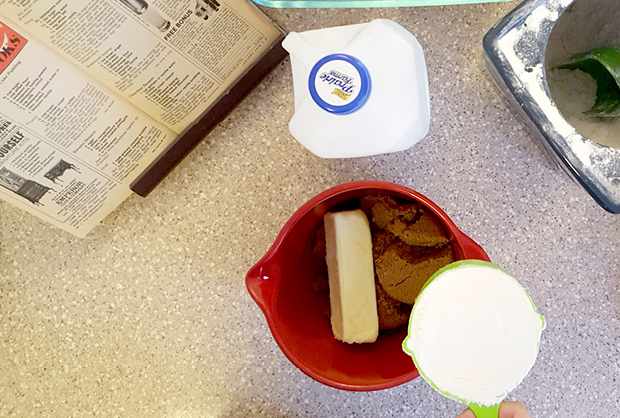 Meanwhile, add egg, cottage cheese, milk, soda, and vanilla to the remaining crumb mix. Step 2—Everything but the vanilla. A bit lumpy, I blame the cottage cheese. It looks a bit lumpy due to the cottage cheese, but I can say: it tastes pretty good. I mean, if I'd tasted it. Which you shouldn't do because of the raw egg. 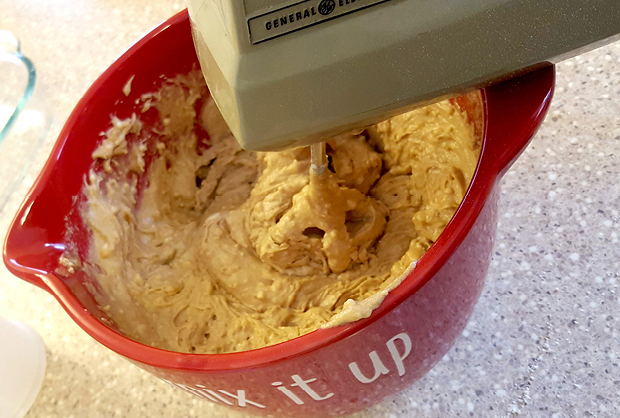 Spread into a greased 7-1/2 x 11 greased pan. Top with the crumb you held back and back in a 350º oven for 35 minutes. Man, I did a crappy job spreading the mixture and the crumbs out. Look at it, isn't it beautiful! Know what I like best about it? It doesn't have to go in my fridge. I have had desserts taking up my much-needed refrigerator space for the last two weeks. This one can sit on my countertop. Serve with a cuppa coffee or tea. A lovely end to a chilly winters day. 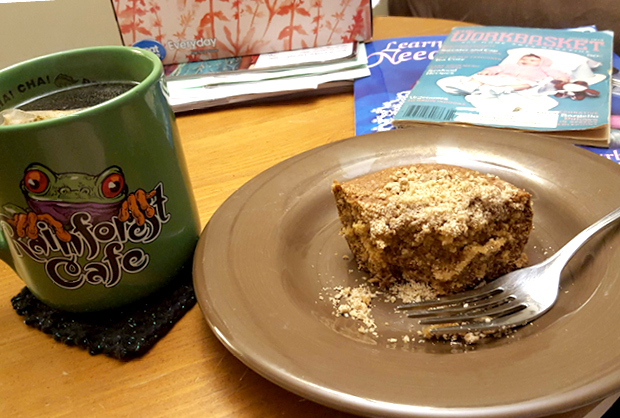 Frog (tea) and Crumb cake! 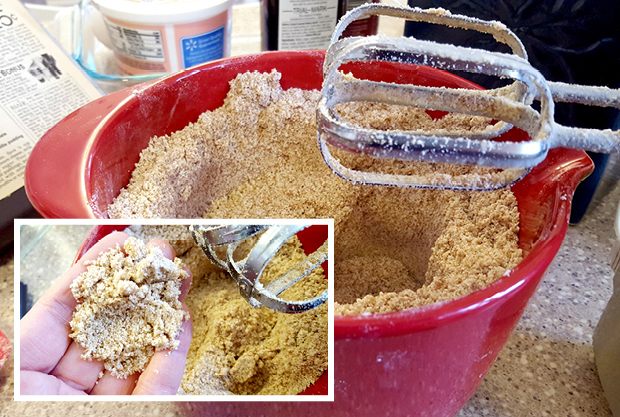 Mix brown sugar, butter, and flour together to form a crumb (sand like texture). Save 3/4 cup for top of cake. 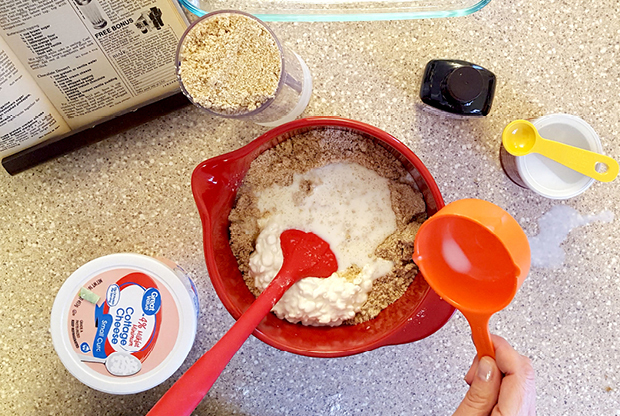 Add egg, cottage cheese, milk, and baking soda to crumb mixture. Beat on high speed until smooth. Add vanilla and mix. Place in a 7.5 x 11 greased pan. Add topping mixture and bake for 35 minutes.